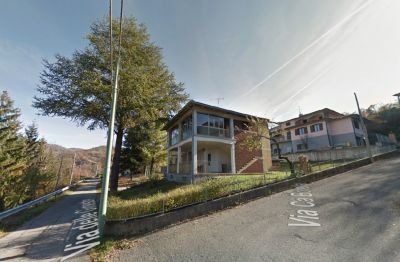 In Cerredolo, in the Municipality of Toano (in the province of Reggio Emilia on the border with that of Modena, about forty km from both the provincial capitals and about twenty km from Castelnovo Monti and Sassuolo), VILLA BIFAMILIARE in a dominant position panoramic view over the hills and the river Secchia, COMPOSED OF TWO LARGE INDEPENDENT APARTMENTS of over 100 square meters each, arranged on two floors, with fireplace and wood stove as well as radiators connected to independent methane heating systems, open terrace of 50 sqm , more spacious covered terrace and glazed porch with porch, large private parking, two garages, attic, cellar, wood shed, plus adjoining storage on the back with porch and laundry room, dominated by former barn converted into warehouse and flanked by former hen house masonry, clean and disinfected, to be used as a shelter for mower and similar or reusable as before. Energy certified properties and li from mortgages, inserted in ample building land of more than one biolca, with common GARDEN fenced in masonry, ornamental and fruit trees, LARGE WATER-BASED WATER-BASED SORGIVA, sufficient to feed a possible swimming pool for free. The two apartments are time occupied, respectively, one from the owner and the other from the only son of the owner, but both will be released according to the needs of the purchaser, in any case at the latest at deed. SI SELLS ALL IN BLOCK at the price indicated, OR SEPARATELY, even at odds to be decided (max 50%), and obviously the price changes. WE RECOMMEND TO COME TO SEE, WITHOUT COMMITMENT, TO MAKE AN IDEA AND EVALUATE THE UNIQUE AND VALUE OF THIS PROPERTY. On the final price and on the purchase formula THE SELLER PART IS AVAILABLE TO FIND THE BEST AGREEMENT with whoever is really interested. For example: purchase of 50% and rent of the remaining 50% with the purchase option, obviously discounted of the fees paid; formula that allows an initially modest financial commitment, as well as tax benefits for the buyer and facilitations in obtaining a possible loan. PURCHASES (and invites you to consider) the purchase formula to redeem in particular for those wishing to buy a single apartment and avoid access to a burdensome loan. NB The property is visible online by entering the address on the maps Google and using the "street view" whose images are dated 2011: in the meantime some improvements have been made in the back: reinforced concrete sidewalk, exterior plaster and new roofing.